It was a very busy summer, not only have we introduced a new release of SAP S/4HANA Cloud, but we have also expanded the deployment options for our customers with SAP S/4HANA Cloud, single tenant edition. The goal of this blog is to summarize the improvements and updates to SAP Activate, an innovation as a service, that are available to help guide your journey to SAP S/4HANA Cloud. Revised the guide for planning and execution of Fit-to-Standardworkshops, updated guidance is available in an accelerator here. 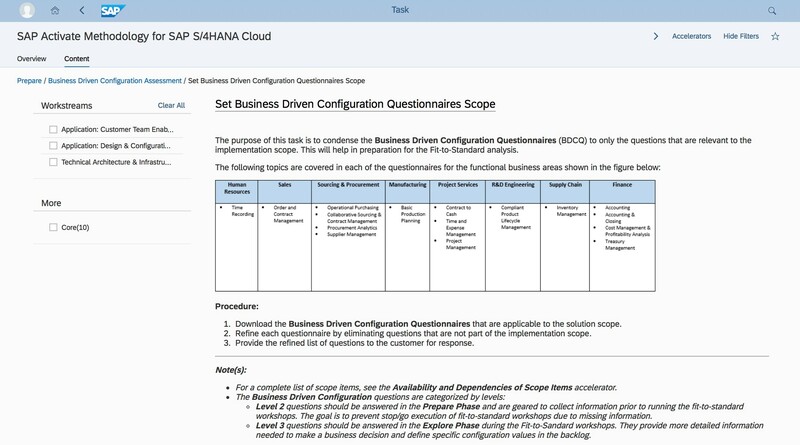 Updated Business Driven Configurationquestions to increase use of business terms and reduce use of SAP terms. Multiple tiers of questions were added to reduce the effort within the Prepare phase while still providing the necessary detail for the Fit-to-Standard Analysis workshops in the Explore phase (see details in this task). Added a new task with new accelerators to enable tracking of configurationduring the Realize phase, see the task description and accelerator for details. Remodeled Output Management deliverables and task guidance, including new accelerators, you can view the entire workstream here. Along with the methodology, we have released updates to the pre-delivered configuration content. 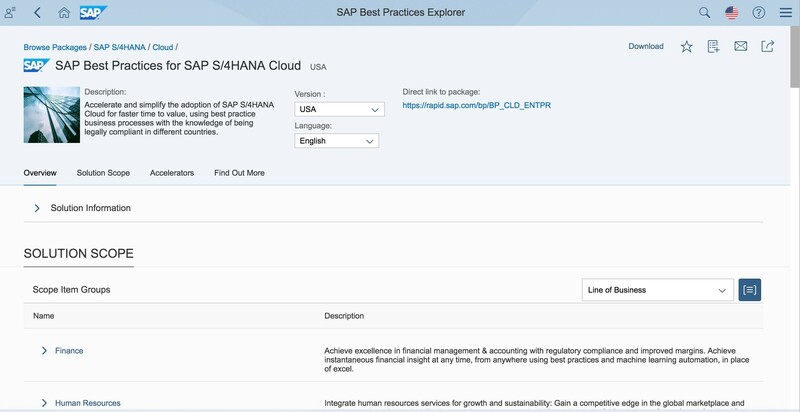 The description of all available pre-delivered functionality is detailed in the SAP Best Practices Explorer, in the SAP S/4HANA Cloud Best Practices package. I have posted and highlighted various improvements which SAP S/4HANA Cloud 1808 delivers in my earlier post: Intelligent ERP Update: SAP S/4HANA Cloud 1808 Release. 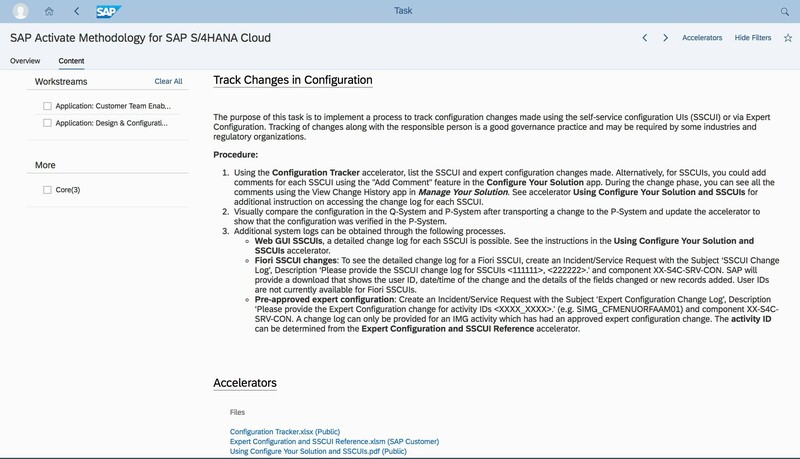 Shortly before releasing SAP Activate for 1808, the team has released first public version of the SAP Activate for SAP S/4HANA Cloud, single tenant edition. The content builds on the available SAP Best Practices for SAP S/4HANA and deployment approach specific to the single tenant edition. 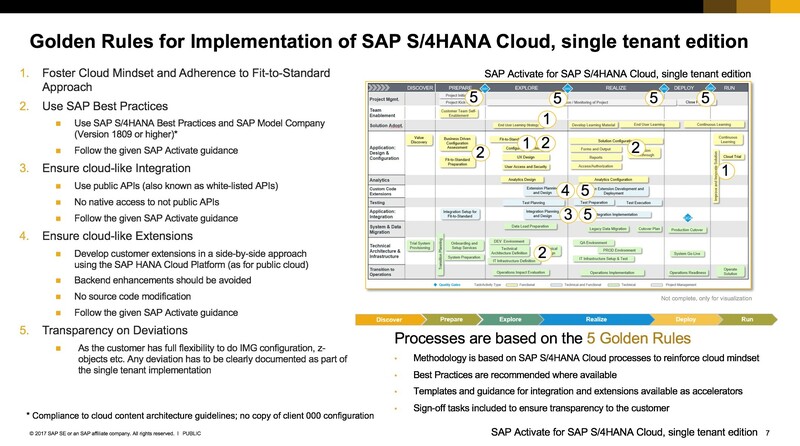 Petra Kloess summarized the approach in her blog The 5 Golden Rules for Implementing SAP S/4HANA Cloud, Single tenant edition. 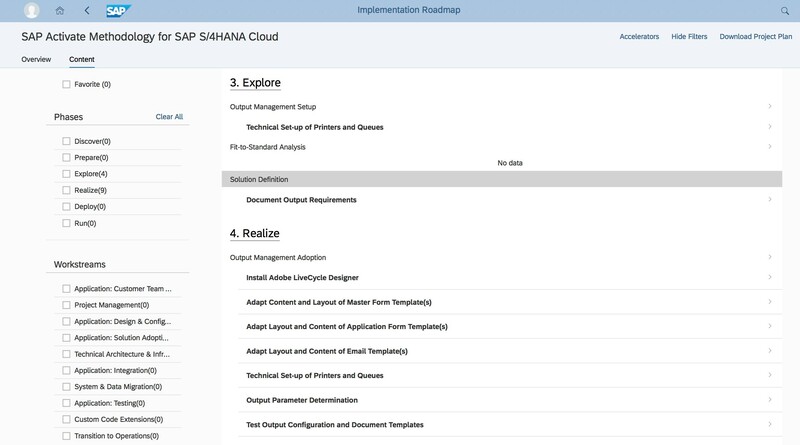 The blog highlights the recommended deployment practices for SAP S/4HANA Cloud, single tenant edition to position your business for potential future transition to SAP S/4HANA Cloud. My team will be at the SAP TechEd events in Las Vegas, Barcelona, and Bangalore. We invite you to join one or more of the following sessions and learn about the new SAP Activate capabilities and content we are going to talk about at TechEd 2018. Links to Bangalore sessions will be posted when the detailed agenda is available on the event website. Do you have feedback you want to share with me or my team? Use the comments function below on this page and let us know your thoughts. If you have questions, you ask them in the SAP Activate Jam (you can sign-up here for access) or in the SAP S/4HANA Cloud Community. We are monitoring both places for SAP Activate related questions and feedback to ensure your questions are being addressed.